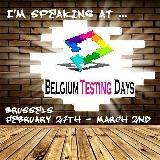 Last week, I had the honor of being a speaker at Belgium Testing Days in Brussels, Belgium. It was one of the best conferences I’ve ever attended; the energy and interactions among the presenters and attendees was incredibly powerful and inspiring. The theme of the conference, “Breaking down the wall to boost up the business” is so relevant, especially since it is our role as testers to deliver information that organizations may not want to hear and like the late Rodney Dangerfield, we just don’t get no respect. Not so at this conference! The keynote speakers including Lee Copeland, Jerry Durant, Peter Morgan and Susan Windsor all shared ways of breaking down walls in various ways. Lee talked about how to use metrics to deliver the appropriate message. He stressed measuring accomplishment rather than effort and not measuring anything that you aren’t going to do something about. Jerry Durant challenged us to consider how culture affects outsourced test projects and showed us how to provide the right kind of oversight to make offshore testing a success. The track sessions were just as awesome. In his “Value Synch” presentation, Rob Sabourin showed us how to break down walls by being in tune with what important to our stakeholders. Quality is not only conformance to requirements, but also sustainability of purpose; it has to be valuable to the users. And what the users and stakeholders value can change. As quality professionals, we must be attuned to those value changes and be “in snych”. Jean-Paul Varwijk gave us a framework to focus our testing with his “7 W Questions of Testing” and Doug Hoffman showed us how to plan our testing based on 9 or rather 13 Oracles. Oracles are principles by which we evaluate whether or not the software is behaving reasonably. Astrid Larsen used the perspectives of the “Desparate Housewives” to explain the role of the test manager in each phase of the product development lifecycle. Huib Shoots showed us the importance of understanding how we think in “What Testing Can Learn from the Social Sciences”. By examining the mistakes people make and why they make them, we can avoid mistakes and be better testers. Peter Varhol and I talked about how to evangelize quality and get commitment to quality in quality-averse organizations. We went on to discuss how to create quality with little time, money and resources, important because when quality-averse organization commit, they usually don’t commit much. It has been said that people don’t remember what you said, but how you made them feel and this sums up the crowning achievement of this conference. Mieke Gevers, Nadine Raes and their team did so much to make us feel welcome and appreciated. As value and appreciation are the keys to breaking down all ways, they, themselves, achieved the goal of the conference. This entry was posted in Uncategorized and tagged conference, software testing on March 8, 2013 by gerieowen.